Protecting your employees is our number one priority. Pro-Am Safety is a distributor of a wide range of safety product. We also offer many safety related services. Our mission is to provide the best possible service to our customers with a staff that is passionate about workplace safety. Finding solutions to your safety needs is our speciality and we have over 30 years of experience helping customers like you. 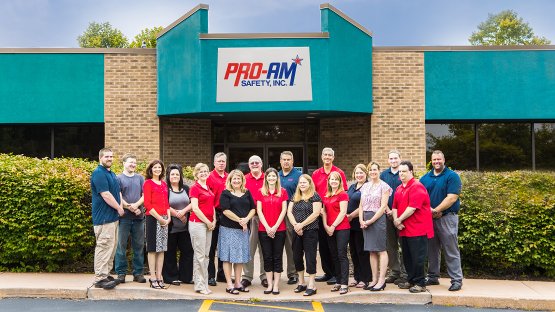 Pro-Am Safety has been providing workplace safety solutions in the Western Pennsylvania area since 1982. Our headquarters is located just north of Pittsburgh in Warrendale, PA. We service Western PA, Ohio, West Virginia and Florida. We have an experienced staff of 32 people who support our outside sales team to bring our customers the absolute best service. Our outside sales force is a highly trained group. Through direct sales consultation, we will work with you to fulfill your safety needs. Pro-Am Safety is a complete personal protective equipment provider and service center for fire/rescue, industrial, welding, and oil and gas customers. We carry a wide spectrum of products. If you are unable to find a product online, give us a call. We will be happy to assist you. Our main goal is to give you the best pricing for quality top brand safety supplies. We are a direct distributor of over 125 industrial and fire safety manufacturers. We look forward to the opportunity to serve you! The entire Pro-Am Safety staff goes the extra mile to ensure your employees are protected on a daily basis. We focus our experience on sending your employees home the same way they came to work. We take pride in serving companies who place a high value on maintaining a culture of safety. Pro-Am Safety is a participating member in the SafetyNetwork.me network. We are dedicated to all those who rely on the key players of the safety industry to help them get home safe, day in and day out.